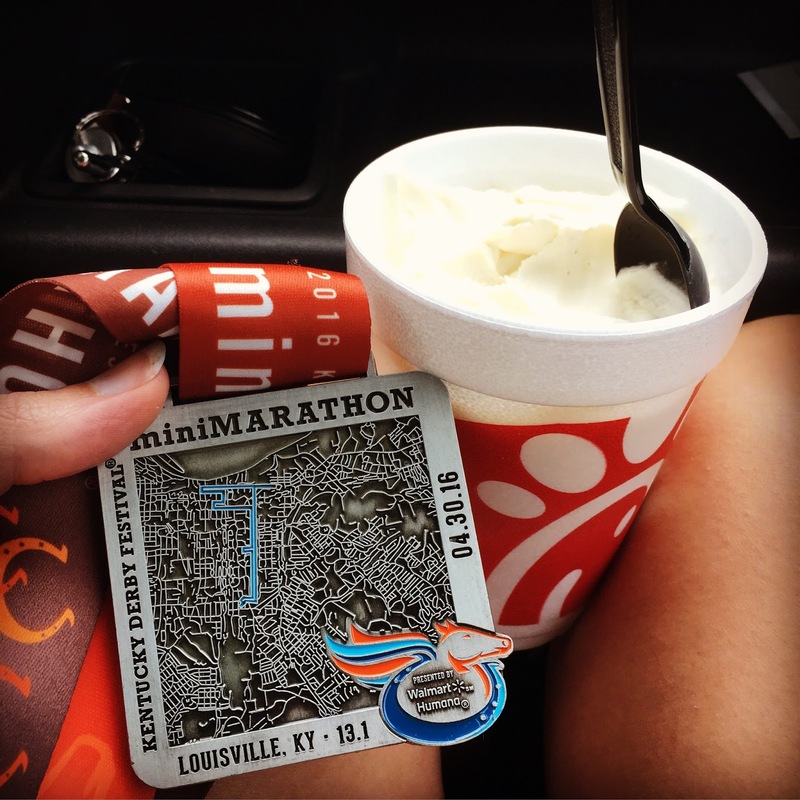 Saturday I ran my 22nd half, the Kentucky Derby mini marathon. 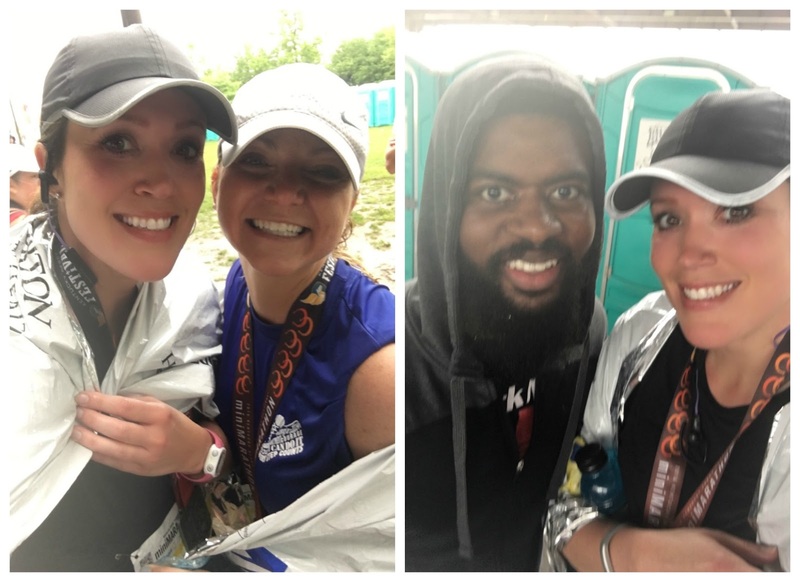 It was a very rainy and wet race, but at least it was fairly warm. I ran it last year, in the very same conditions! I was planning on going Friday morning. I dropped the 4 year old I watch off at preschool, and then the baby and I headed downtown to pick up my packet. Now, I loathe driving downtown. I don't go unless I have to, it stresses me out! I drove around for about an hour and could not find where I'm supposed to park, then I couldn't find a parking place. 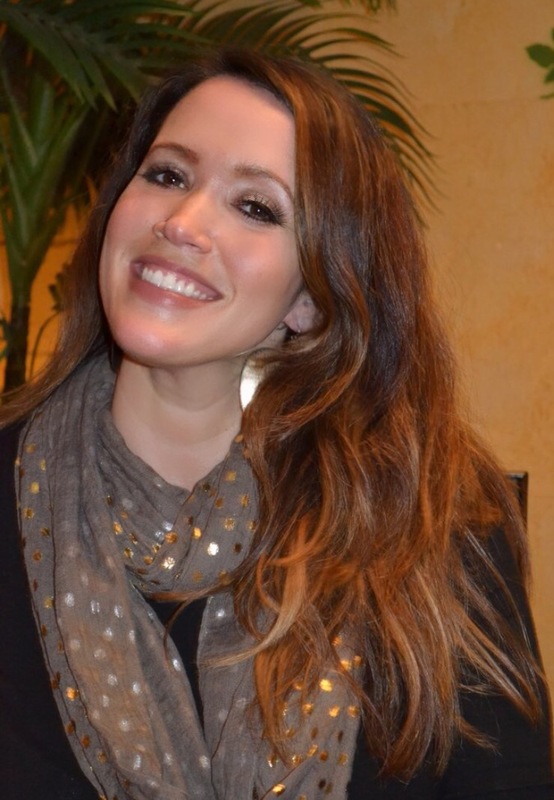 If I was alone, I wouldn't have minded walking a mile to the expo, but since I had the baby, I didn't really want to do that. I finally decided to ask a friend to pick up my packet, because I had to get back and pick up C from preschool. Friday night I stayed with Amanda, Julie and Lindsay. 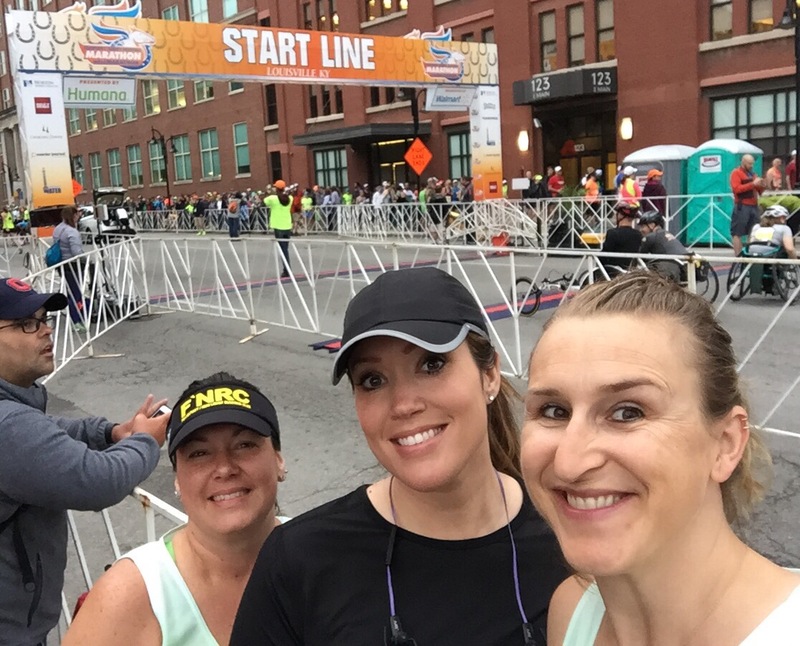 Amanda and Julie were doing back to back marathons, the Derby full, and the Flying Pig. Lindsay was doing the Flying Pig full. Those girls are amazing!! Saturday morning we woke up at 6, got ready, and then headed out the door. It was so nice to be able to walk to the start line. The day started out cool and cloudy, perfect weather. On the way to my corral I ran into BJ, and then a little bit later I saw Darrin. I love meeting blog/Instagram friends in real life! At 7:30, all 16,000 of us were off. There was no rain for my first 5 miles, and I was HOPING it would last, but it wasn't meant to be. The rain started, and it didn't stop once. It wasn't a heavy downpour, so that was nice. It was just a light, steady rain. And since it wasn't cold, I didn't think it was too bad. I honestly thought I was doing really good. It's a super flat course, so I hardly walked at all. I walked through the water stops, and on a couple small hills, and then a couple times towards the end, but overall, I mostly ran. So, because of that, I thought maybe I'd come close or even beat last years time of 2:33. My favorite part of this race is running through Churchill Downs on the infield. It was so cool to see the horses and jockeys out there practicing, even in the rain. Loved it! Because of the rain, I didn't get any pictures during the race. I ran into my favorite Rebecca, (or Belle) on the course. I had been so worried about her running injured, but she pushed through and killed it! My finish time was 2:39. I was so disappointed. That was 2 minutes slower than my Carmel half, and this course was much flatter. Maybe the rain slowed me down, but I didn't feel like it did at the time. So, I was bummed about that. But I still had a great time, got to see some sweet friends, and I got to run, which always, always makes me happy! And then...ice cream from Chick Fil A. Because ice cream. I love this race. Love the volunteers who stood out for hours in the pouring rain, cheering us on. Loved everything about it. Hopefully next year it'll be dry! Congratulations on doing the race. That's a nice medal too. Thank you, Mark. I love the medal! Glad you had a good race. I notice I run slower in the rain so maybe that was it. I was so impressed with all the volunteers who were drenched to the bone too. That's some dedication!!! Back to back marathons? DEAR LORD - those ladies must be made of STEEL. I cant even imagine! Ahhh - good hubby waiting at the finish for you!!! Now, let's start praying for next years race to be RAIN FREE! PLEASE LORD!!!! Wow...that packet pickup sounds ridiculous! I've never done a huge race, so I can't imagine that. It makes me so happy when I see people connecting and meeting at races. It's like a reunion of the runners...lol. It's one thing I love about running--the bond we all share. And the awesome people we meet along the way. I absolutely love the running community. That's where I've made some of my closest friends, like you! Yes, that's the streets of Louisville, and then the race route. Thank you, my sweet friend! 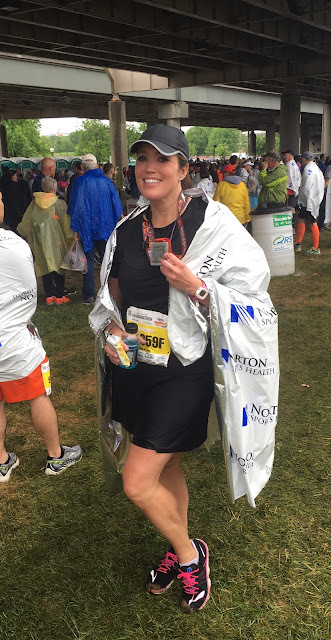 Wow - 22 half marathons is so freaking awesome. You are fabulous. The sheer fact you raced three half marathons speaks volumes. That should not be overlooked. The KDF will always hold a special place in my heart as it was my first half in 2012. It's always been a chaotic race set-up but a fun route. April 29, 2017 HAS to be dry! Your photos look great. Thank you so much, Nikky. I do love the route. I hope you can do it next year!